Ayatollah Khamenei has urged Western youth to build on an accurate understanding, profundity, and unpleasant experiences of the past to lay the foundation for proper, honest interaction with the world of Islam. 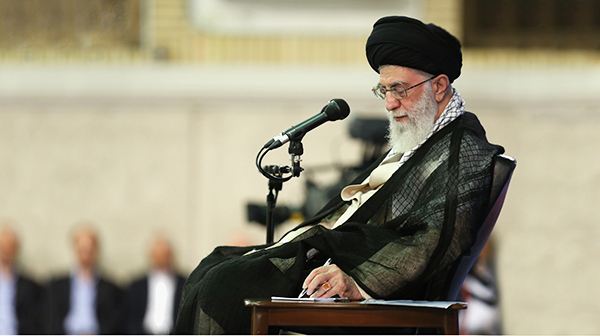 In a letter addressed to Western youth, Supreme Leader Ayatollah Ali Khamenei described the horrible terrorist incidents in France [on November 13] as grounds for like-mindedness. The horrible incidents caused by blind terrorism in France once again prompted me [to put pen to paper] to address the youth. For me it is unfortunate [to see] such incidents lay the foundation for [our] exchanges. But the fact remains that if painful incidents fail to set the stage for [measures to seek] a remedy and [if they fail to provide] a platform [for us] to put our heads together, the damage will be twice as much. The suffering of any human, anywhere in the world, is in itself saddening to fellow human beings. The sight of a child dying right in front of the eyes of loved ones, [the sight of] a mother the joy of whose family turns to sorrow, [the sight of] a husband who rushes the lifeless body of his wife in one direction or another and [the sight of] a theatergoer who does not know the final act of life is only a few seconds away are not [the kind of] sights that would not evoke human emotions. Anyone blessed with affection and a sense of humanity finds such sights grievous and saddening, whether they happen in France, in Palestine, in Iraq, in Lebanon or in Syria. Certainly, [the world’s] 1.5 billion Muslims feel the same way and are disgusted and repulsed by the masterminds and perpetrators of such calamities. But the point is that if today’s sufferings are not used as building blocks of a better, safer tomorrow, they would be downgraded to vain, bitter memories. I am certain that only you, the youth, by learning a lesson from the vicissitudes of life will be able to develop new methods to build the future and block the wrong paths that have landed the West where it is now. It is true that today, terrorism is a concern we share, but you need to know that the insecurity and anxiety you experienced in the recent incidents is different, in two major ways, from the hardship the Iraqi, Yemeni, Syrian and Afghan people have endured over the years. First, the Muslim world has been a victim of terror and violence on a much larger scale, on more occasions, and over a much longer period of time. Second, unfortunately, these acts of violence have always been supported – in different forms and in an effective manner – by some major powers. Today, there is hardly anyone with no knowledge of the role of the United States in creating or shoring up and arming Al-Qaeda, the Taliban and their unholy offshoots. On top of such direct support, those who are known for openly advocating Takfiri terrorism always find their way onto the list of Western allies despite having the most underdeveloped political systems [at home]. It comes as the brightest and most progressive ideas arising from dynamic democracies in the region have been ruthlessly suppressed. The West’s double standards in dealing with the Awakening Movement of the world of Islam are a perfect example of contradiction in Western policies. Another aspect of such contradiction can be seen in support for Israel’s state terrorism. The oppressed people of Palestine have been grappling with the worst kind of terror for more than 60 years. Today, the European people may shelter in their homes and avoid crowded public places for a few days; as for a Palestinian family, even home does not provide shelter from the Zionist regime’s death and destruction machine. That has been the case for dozens of years. Today, what kind of violence is comparable to the Zionist settlement activity as far as severity of atrociousness is concerned? Without ever being admonished – in a serious and effective way – by its influential allies or at least by supposedly independent international institutions, this regime demolishes – on a daily basis – Palestinian homes, orchards and farms without giving them a chance to move their belongings or harvest their crops [first]. All these often unfold in front of the panicked, teary eyes of women and children who witness the beating of their family and on occasion their transfer to frightening torture chambers. Do you know of any other atrocity on such a scale perpetrated over such a long period of time in the modern world? If riddling a woman with bullets simply for protesting an armed-to-the-teeth soldier on the street is not terrorism, what is it then? Shouldn’t it be called extremism simply because such barbarity is committed by the military of an occupying government? Or maybe, simply because such images have repeatedly hit our TV screens over 60 years, they do nothing to rouse our conscience! The troop deployments of recent years to the Muslim world which have claimed numerous lives are yet another example of the contradictory logic of the West. In addition to suffering the loss in blood, the countries under assault have lost their economic and industrial infrastructure; their march toward growth and development has been halted or slowed down; and in some cases they have been set back decades. Still they are audaciously called upon not to view themselves as oppressed. How is it possible to demolish a country, reduce its town and villages to ashes and then ask its residents not to view themselves as oppressed? Isn’t it better to offer a sincere apology instead of urging them to close their eyes [to realities] and forget the calamities? The hardship the Muslim world has endured over the years as a result of assailant hypocrisy and disguise is no smaller than the material damage. Dear youngsters, it is my hope that you change this mentality which is tainted with hypocrisy now or in the future, a mentality which is skilled at disguising distant goals and sprucing up malicious motives. In my opinion, reforming this violent mindset is the first stage of establishing security and calm. For as long as Western policies are dominated by double standards, for as long as powerful advocates of terrorism dichotomize it as good and bad, and for as long as state interests are given preference over human and moral values, the root causes of violence should not be looked for anywhere else. Unfortunately, over the years these roots have found their way into the depths of cultural policies of the West too and have helped organize a soft, silent onslaught. Many countries in the world take pride in their native, national cultures; exuberant and generative cultures which have, for centuries, fed human communities well. The Muslim world is no exception. In the contemporary era though, the West is tapping advanced tools to insist on cultural simulation and cloning. I view the imposition of the Western culture on other nations and humiliation of independent cultures as an extremely harmful silent act of violence. Humiliation of rich cultures and disrespect for their most revered aspects comes as the substitute culture does, in no way, have the capacity one expects a replacement to enjoy. For instance, aggressiveness and moral promiscuity, which have unfortunately turned into major components of the Western culture, have dented its approval rating and stature even in its place of origin. The questions that arise now are “Will our rejection of an aggressive, obscene culture that lacks in spirituality make us blameworthy?” and “Will our prevention of destructive floods which come hurtling toward our youth in the form of quasi-cultural products make us deserve blame?” I won’t downplay the importance and value of cultural bonds. Whenever such bonds happen in normal circumstances and are accompanied by respect for the recipient community, they bring about growth, exuberance and richness. On the other hand, imposed unharmonious bonds are unsuccessful and detrimental. I regret to inform you that vile groups like Daesh [an Arabic acronym for ISIS] are the product of such unsuccessful mergers with imported cultures. If the problem were truly ideological, similar incidents would have happened in the world of Islam before the emergence of colonialism, but history suggests otherwise. Historical evidence clearly shows how the confluence of colonialism with a rejected extremist ideology in the heart of a primitive tribe sowed the seeds of extremism in the region. Otherwise, how is it possible for one of the most ethical and humane religions of the world whose core scripture slams the killing of a single human being as being equal to the murder of all humanity to create a piece of garbage like Daesh? On the other hand one needs to ask why those who are born and bred in a European environment, mentally and intellectually, join these groups. Can you believe that a couple of trips to war zones may suddenly render an individual so extremist that they open fire on their countrymen? Certainly, the role of a lifelong unhealthy cultural nutrition in a poisoned atmosphere that breeds violence should not be forgotten. A comprehensive analysis should be conducted, one that would shed light on impurities of society, both open and disguised. Maybe the in-depth indignation some strata in Western societies have developed as a result of disparities and at times legal and structural discrimination during the industrial and economic boom years has given rise to complexes that bubble up in a morbid way every once in a while. Anyway, you are the ones who should unravel the outer layers of your society to find and get rid of the knots and grudges. Instead of deepening the gaps, we should bridge them. The big mistake in the fight against terrorism is [showing] rash reactions that would widen the existing gaps. Any sentimental, rash measure that may isolate or send jitters through the ranks of the Muslim communities of Europe and America – made up of millions of active, responsible individuals – or deprive them of their basic rights more than before and marginalize them will not only not solve the problem, but will widen the gaps and exacerbate the hard feelings. Shallow, reactive measures, especially when such measures are lent legislative legitimacy, will have no effect other than further polarizing [the world] and thus trigger more crises. I gather in some European countries regulations have been put in place which encourage citizens to spy on Muslims. These measures are oppressive, and we all know that oppression boomerangs willy-nilly. Besides, Muslims do not deserve to be subjected to such ingratitude. For centuries, the Western world has known Muslims well; both when the strangers showed up as guests on Muslim soil and developed designs on the riches of their hosts and when they served as hosts and took advantage of the Muslim workmanship and intellect. They [Western people] were mostly treated with compassion and patience. Therefore, I want you, the youth, to build on an accurate understanding, profundity, and unpleasant [past] experiences to lay the foundation for proper, honest interaction with the world of Islam. In that case, in the not-too-distant future you will see the wall you have built on such foundation offer a shade of trust and confidence to its architects, award them the warmth of security and tranquility and create a ray of hope in a bright future for the globe. * In January, following terrorist attacks in France and the consequent Islamophobia those attacks set in motion, the Islamic Revolution Leader wrote a letter to the youth in Europe and North America.